If you like your action RPGs to be light-hearted and full of humour then DeathSpank will be your perfect game. The game is available across all major platforms and will send you on a comedy filled adventure. In the game you’ll play as DeathSpank as he quests to find a special item known only as ‘The Artifact’ which was stolen from him by the evil Lord Von Prong. Leaving DeathSpank with none of his powerful equipment he must help the town folk and other villagers by completing side quests in order to become powerful enough to face Lord Von Prong and claim what is his. The games story is closely tied with its sequel, DeathSpank: Thongs of Virtue. DeathSpank is set in a fantasy world during medieval times with weapons and magic reminiscent of that time period although also having a futuristic twist. Combat in the game is very much inspired by Diablo but incorporates a combo system which allows players to unleash devastating attacks. 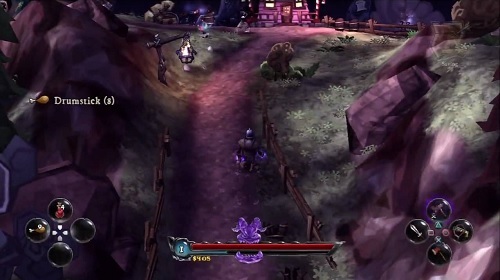 Item depth is also somewhat borrowed from the popular Diablo series with plenty of equipment pieces to be found and upgraded throughout your adventure. Character conversations make up a decent amount of gameplay with dialogue being the primary mode of storytelling and dialogue decisions altering the player’s access to side quests. You can expect over 70 side quests on top of the 30 something main quests so there definitely isn’t a shortage of quests available. 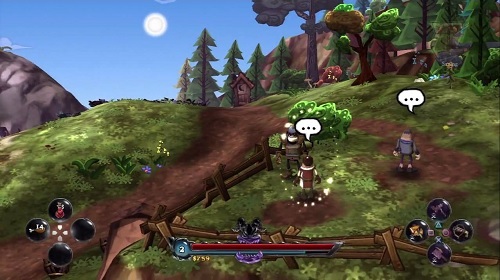 If you don’t want to tackle to the game by yourself players can load up a multiplayer game with a friend and have them take control of Sparkles the Wizard to provide spell support. DeathSpank is a highly enjoyable experience with a comedy style that isn’t seen very often. While in terms of gameplay hours it’s on the short side you’ll be playing it for the light-hearted experience. A light-hearted and comedy filled experience. Play multiplayer with one other friend. Impressive and explosive combat styled after Diablo. No shortage of items to find and equip.